This white paper explores the underlying systemic factors that cause antibiotic shortages, and identifies how governments, regulators, the pharmaceutical industry and others can fix the antibiotic market. Between 2001 and 2013, 148 national antibiotic shortages occurred in the United States alone. In 2010, 15 countries reported national shortages of injectable streptomycin, jeopardising the treatment of tuberculosis patients. An ongoing penicillin shortage is currently affecting at least 39 countries, now including Brazil, Germany, the Netherlands, the US and India. In Brazil, this shortage coincided with a syphilis outbreak that, as a result, could not be brought under control. Between 2012 and 2015, the number of babies born in Brazil with congenital syphilis has more than doubled. 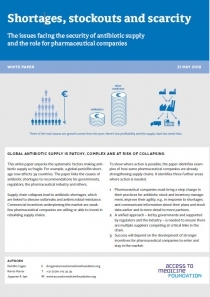 This white paper explores the underlying systemic factors causing antibiotic shortages, and identifies how governments, regulators, the pharmaceutical industry and others can fix the antibiotic market. 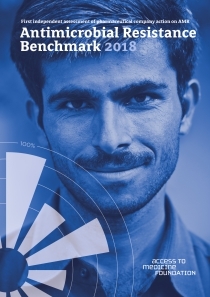 To show where action is possible, it identifies examples of what pharmaceutical companies are already doing, drawn from the 2016 Access to Medicine Index, 2017 Access to Vaccines Index and 2018 Antimicrobial Resistance Benchmark. Patchy antibiotic supply is linked to antimicrobial resistance. When antibiotics are unavailable, doctors must resort to less optimal treatments, with poorer clinical outcomes and a higher risk of antimicrobial resistance (AMR). The complexity of supply chains also raise the likelihood of poor quality antibiotics reaching the market and being easily available, facilitating the overuse of antibiotics.